The ‘modern’ reflux classifier was invented by Kevin Galvin of New South Wales who applied for an Australian patent in 2000 (application 09/890,487) and was awarded a USA patent in 2004 (US 6,814,241). Commercialization is by Ludowici Mineral Processing Equipment Pty Ltd –www.ludomin.com/products/reflux_classifier.htm. The ‘modern’ reflux classifier follows innovations such as the ‘Method and apparatus for cleaning sand or grading sand…’ patented in 1947 by A.B. Morris (US #2,426,839). A reflux classifier is a combination of E-tower and lamella settler. More than one set of lamella is possible, but a set of lamella caps the E-tower as an ‘inclined section’ for best results [194-199]. This inhibit heavy particles escaping with the over flow water, enabling fine particles to be “removed or classified in a more concentrated form” and is more tolerance of feed fluctuations. This account is conjectural, as the reflux classifier has yet to be tested with fine gold. The device will process feed up to 5mm size. Intuitively feed would be screened into fractions (e.g. >1mm, 1-2.5mm and 2.5-5mm) each directed to a different reflux classifier. In practice a reflux classifier is most advantageous for the <1mm fraction. 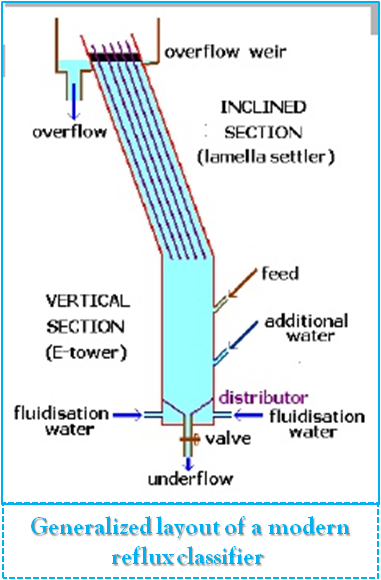 Feed is introduced towards the top of the E-towerand begins to fall through the water column. This isopposed by the up welling of injected fluidisation water and a wobbling ‘teetered’ mass of fluidised particles results, only the densest and heaviest particles reaching the bottom as final concentrate. The rising column of water lifts the finest particles (including very fine gold) and up well between the inclined plates of the lamella. In the inclined section, the trajectories of the densest fine particles fail to clear the top of the plates and so these particles collide with the plates. The ensuing frictions lows the dense fine particles and they slide down the plates back into the E-tower. The plates are inclined at about 70° degrees – shallow enough to ensure denseparticles hit the plates, yet steep enough to ensure particles slide down it . Other particles fail to settle and continue upwards to escape as tailings. To ensure fine gold will settle yet quartz remain in suspension the ratio of plate length to plate-plate gap is as great as 200:1 (‘aspect ratio) [195,197], far more than the 40:1 used to separate coal from mineral matter. The Ecologic concentrator is an innovative type of elutriation tower (E-tower) recently developed byEcologics Ltd of New Zealand (www.ecologics.co.nz).Marketed as the Ecologic ‘gold concentrator’, thedevice is a remarkable ‘catch-all’ able to catch all shapesand sizes of gold particles, large and small. This istechnically challenging, for the high-energy Newtoniansetting regime needed to catch nuggets and eject large quartz is also capable of flushing out fine gold and flat gold with the tailings. A trowel-full of pay gravel is put on the static simplescreen that sits on top of the conical device. The device can process up to 2m3 /hour of easy-to-dig pay gravel, less so if clayey.Water is supplied by the innovative pedal-poweredEcologics water pump patented worldwide in 2006 (WO#2006071127). About 100 litres of water are re-circulateduntil it becomes too contaminated. Both pump and concentrator can use water that is clayey or silty.The material on the screen is swashed from below by agitated water and the fines fall though the screen. Washed over size remains on the screen and is checked for nuggets then discarded. Black sand and gold fall to the bottom of the cone, in spite of the turbulent up-flow,while fine light particles are swept out. Water is introduced violently from the bottom of the device. Rather than a delicately balanced teeter, this is an up-welling mass of energetic water pumped in pulses via a flexible plastic pipe from Ecologic’s pedal-powered water pump. The pulsing action keeps the water in the cone agitated and causes it to continuously spill over the rim of the top of the cone. The device is stopped to gather the concentrate settled in the bottom the cone, by flushing out with a little water. It is then upgraded by panning or other means.The inventor considers coarse gold recovery is 95%and fine gold recovery 80-90%. 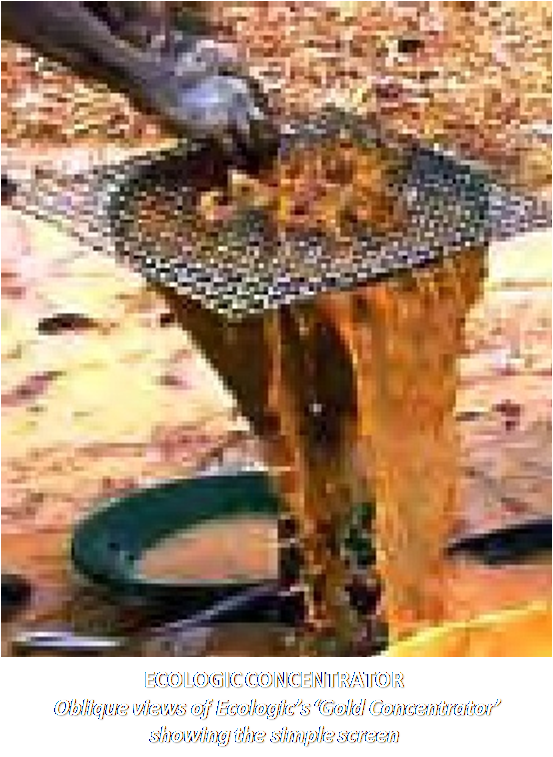 In some field tests only 0.2% of the gold reported to the tailings. Generalised test results have been published in South Africa.